The Gond tribe is distributed all over India. The Gonds of Odisha can be divided into two entirely different groups. The Gonds of Western Odisha have been highly acculturated into Hindu society and have attained the status of a worrier caste. 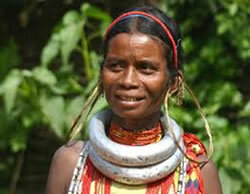 The Gond of a part of Kalahandi and Koraput are a hill tribe having their distinctive dress, habits and customs. The recent demographic history treats them as immigrants to Odisha. As a petty business community their nativity is traced to Madhya Pradesh. Their main occupation is agriculture or Agricultural labourer. They also go for fishing and hunting for supplementing their income. The population of Gond tribe in Nabarangpur district as per 2011 census is 1.67 lakh. 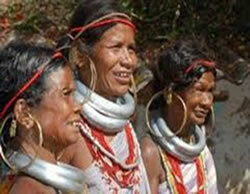 Next to Bhotra, they are an important tribe in the district found mostly in Chandahandi, Jhorigaon and Umerkote blocks. The Gond observe two major festivals. ‘Keslapur Jathra’ is marked with worshipping the snake deity – Nagaba and Madai festival is celebrated to mark the occasion of meeting relatives settled in other parts of the country. The dance performed by men with costumes decorated with peacock feathers on head along with cotton clothes around their waist and smeared ash body is known as ‘Gusadi’. They enjoy the festivities with sharing drinks and playing with the rhythm of drum beats and blowing music throughout the night.